Given a choice, many people would rather deal with water than fire. The latter seems so much more destructive, and anyway, we’re socially conditioned to think of water as a benign blessing. Even in times of hurricanes, tsunamis, and leaking taps, we think water is harmless. However, water can actually do a lot of harm. It can cause mould, pests, and worse. Excessive water damage can cause infections and diseases, and even after doing all your cleaning and repair, that damp smell can be hard to get rid of. 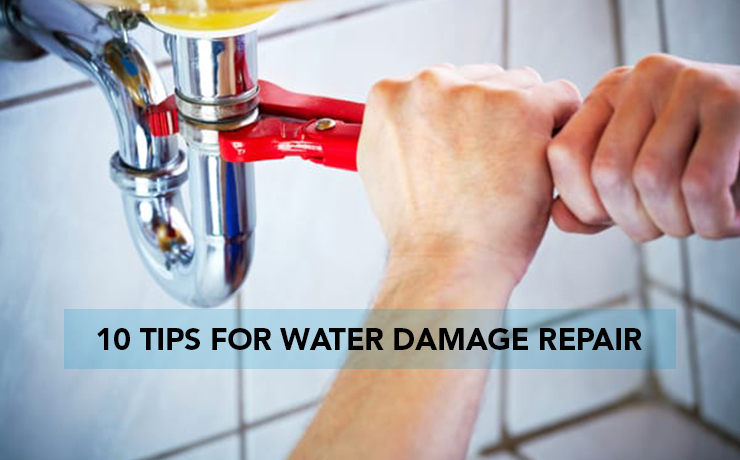 Here are a few suggestions on dealing with destructive water. Prevention is always better than cure, so as much as possible, avoid water damage. If you live in an area prone to natural disasters, install waterproof and windproof shutters. If you’re traveling, shut off the water mains to avoid unnoticed drips. Just before the rainy season, check your roof for leaks. Review your taps for safety, installing stainless steel indoors and frost-proof piping outdoors. We rarely get frosty temperatures here, but it doesn’t hurt. The first sign of a leak is usually a damp spot or a wet patch. It’s easy to focus on finding the source of the leak, but your first priority is to clean up. That damp spot can end up causing mildew, weakening floors, or eating right through, so clean and dry it first, marking the spot with masking tape if you’re worried you might lose it. Then you can hunt down the source. Don’t procrastinate, as leaks can escalate quite rapidly. If you come home and find your stuff underwater, your first response would be to rush in and get the things that matter to you. This could be lethal. You might get electrocuted, catch an infection from bacteria in the water, or be attacked by trapped pests. Turn off the power mains and put on thick gloves and gumboots. Extract any electrical appliance that may cause a shock and put them safely away. Disinfect the flood water if you can, and let it drain before you start fishing around in the debris. As hard as it may be to let go of waterlogged property, it’s essential to prevent the spread of mould and disease. If your items have been submerged, get rid of them. This includes carpeting, wooden floorboards, ceiling panels, and soaked drywall. Pry them off and throw them away as needed. Clothes and soft furnishings have to go as well. Unsealed cement can be a problem too because water seeps into its pores and can harbor toxic germs. Certain rooms in your house have a consistent damp smell. You might think it’s from old clothes, but it’s possible that damp is quietly rotting your interiors. Frequently inspect areas that are prone to damp. These include attics, crawlspaces, basements, under-sinks, and bathrooms. Check for mildew and moisture sources, airing them out and ensuring adequate ventilation. If you need to, you can install under-floor fans and attic ventilation shafts. It can be hard to keep shared bathrooms dry because there always seems to be somebody taking a shower. Remind your household members to open the windows after they’ve used the bathroom, and invest in a sizeable bathroom fan. The hardware store attendant can advise you on the right size to buy, but you can also make an educated guess. Calculate the floor space in your bathroom. If your ceiling is 8 feet high, multiply the figure by 1.1. For a ceiling higher than 9 feet, multiply by 1.5. Check your result against the cfm written at the bottom of the fan, and if they don’t match, get a bigger fan. Sometimes, even with a good fan, you might forget to switch it on. Have your plumber or electrician attach the fan to your light switch so that it goes on and off when your bulb does. You can also have them install humidity sensors. These will automatically turn on the fan when the room gets too damp and turn them off once the humidity has dissipated. Timed bathroom fans are another good option. They run for a pre-set amount of time so it’s okay if you forget to switch them off. But you can get great results with a pretty analogue piece of equipment – a squeegee. By squeezing excess liquid off the floors and windows after a shower, you can drastically reduce the amount of moisture in your bathroom. Once all the water damage has been sorted, you can prevent it from recurring. Your walls and floors probably need a new coat of paint, so buy one that is infused with mildewcide. It prevents mould and mildew from forming and is especially helpful in bathrooms, basements, attics, sink cabinets, or any area routinely exposed to water. You should also look for any gaps and seal them with caulk to prevent further leaks. Visible mildew can quickly become a problem, so you should check for it and deal with it as soon as you spot it. If the mould is on a tile floor or wall, you can scrub it off with a brush and disinfect the area. You can use detergent, bleach, or a commercial anti-mould product. After removing the mould, dry the area to prevent new growth.